The above info came from Elwin Blaine Coldiron, and was edited by yours truly (contact me). The image came from Amazon. 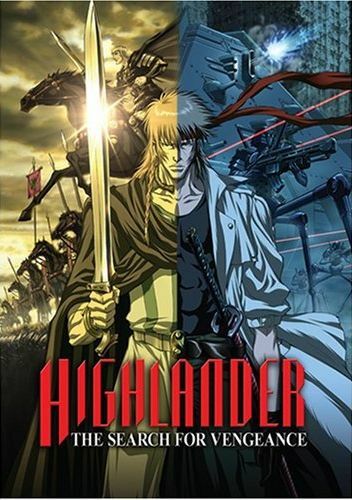 The cult favorite of the 1990's, Highlander, finally has an anime in this new film. Colin MacLoud, a Scottish warrior who has lived for over 800 years, has arrived in the submerged city of New York. He is an Immortal; the only way he can die is if his head is cut-off... which would unleash the Quickening, that which makes him what he is. Colin is looking for the one who slain his lover among the heather in Scotland. There are still survivors struggling to live in New York, and Colin is torn between helping them and seeking out Marcus Octavius, his target. And if he finds him, one thing is sure... THERE CAN BE ONLY ONE!